Anthony Eden, the Secretary of State, broadcast an appeal on the radio on 14th May 1940, requesting volunteers to enlist in local defence units. The government had expected 150,000 volunteers in total, but within 24 hours of the radio broadcast, 250,000 had joined. By August 1940, over 1.5 million men had volunteered. 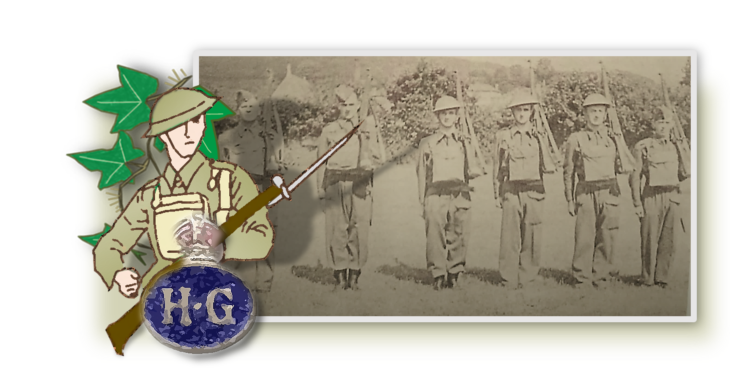 Ivybridge’s Home Guard was No.12 Platoon with Lt. George Mugbridge in charge. It was part of the 15th Devon (Plympton) Battalion. The Drill Hall located in Victoria Park was the unit’s HQ and on most Sunday mornings there were parades, lectures and demonstrations in the use of equipment. There was also a compulsory evening parade once a week. Rifle practice was normally undertaken in the grounds of Cleeve House. From time to time, exercises with other platoons took place over the weekend, involving local civil defence units or with army personnel stationed in the area, and sometimes at Elfordleigh. 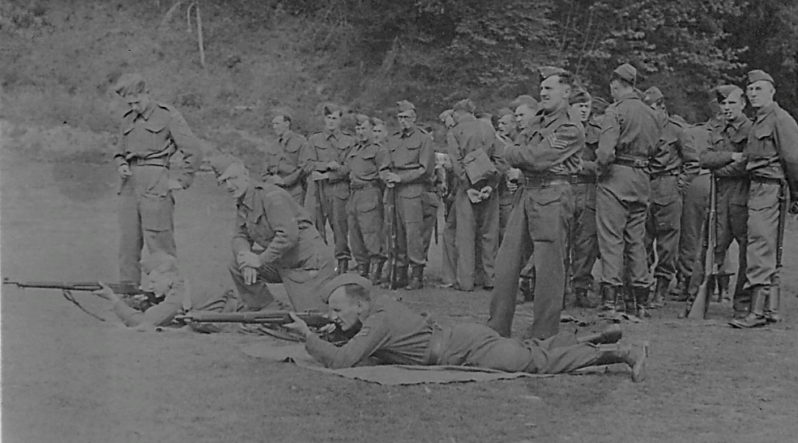 Following the success of D-Day and the enemy in retreat, the need for the Home Guard diminished and in December 1944, the Plympton Battalion, which included the Ivybridge Platoon, was stood down. Although Ivybridge itself was not bombed, the surrounding areas were subject to a number of raids where explosive bombs and incendiaries fell from enemy planes on their return from bombing raids in Plymouth or further a field. An incendiary bomb did not explode, its only object being to start a fire. It was documented that such bombs would penetrate no further than the attic or upper floor, setting light to anything within a few feet. The Women’s Royal Voluntary Service (WRVS) was founded by Lady Reading in 1938 and by the 1940s a million ladies had joined. Uniforms were provided for many of the members. 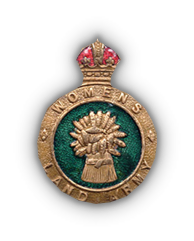 It was initially formed to help recruit women into the ARP movement assisting civilians during and after air raids by providing food, shelter, information, staffing for rest centres and incidents posts and working in field kitchens. They were also responsible for ‘dust bin ovens’, mobile canteens, clothing depots, camouflage netting and collecting salvage and books. Many ladies in Ivybridge undertook a variety of jobs. Some could be performed in their own homes, whilst others required halls or the local school for the staging of emergency cooking demonstrations and similar skills. Although there was no special building designated as a WVS office in Ivybridge, the work undertaken was carried out thoroughly and with great passion. This was formed in 1939 by Lady Denman and this scheme to train women to take the places of the thousands of men enlisting was backed by the government. Pay was £1 8s for 54 hours work and accommodation was often in hostels such as the one at Lyneham House or in homes and farms. More than 30 WLA girls lived at Lyneham. The women undertook a wide range of work from harvesting, hoeing, milking and mucking out. A lorry would collect them in the morning and return them home late afternoon. There was a Land Army uniform of green jumpers, brown breeches or dungarees, brown felt hats and khaki overcoats. As the Land Army was not a military force, however, uniform was not compulsory. There was also an official magazine The Land Girl. The movement was disbanded in 1950. The WLA badge depicted a wheat sheaf as a symbol of their agricultural work. The air raids on the city of Plymouth brought fear and disruption to the daily life of thousands of its inhabitants. At the peak of the night raids, around March 1941, up to 50,000 people were leaving the city at night to seek refuge in the neighbouring towns and villages, bringing almost intolerable burden to these small communities. 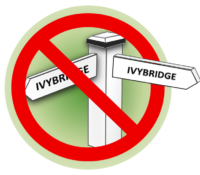 Ivybridge, like many of the surrounding places, were inundated with people coming on foot, bicycle and motorised transport. Many families opened up their homes to relatives and friends living in Plymouth, whilst an official report stated that the council school rest centre quickly filled up each evening, with lorries arriving in Ivybridge loaded with people and buses filled to capacity. The Methodist church hall served tea and refreshments and on occasions over one thousand people arrived in Ivybridge with 300 sleeping in its cinema. On 21st April, 1941, twenty to thirty cars were parked along the Ivybridge road with their owners and families asleep inside. The Women’s Voluntary Service WVS along with church groups, individuals and families rallied to the plight of the refugees, supplying refreshments, assisting with bedding and providing food for them in the mornings. A mobile canteen run by the WVS made a regular appearance at the various centres offering much needed refreshment. Although at the outbreak of war Ivybridge was not considered a high risk area, local people built a variety of shelters around the town. However, with the blitz on Plymouth and the subsequent move of some government departments to Ivybridge, priority was given for building three shelters in Stowford Lodge, then commissioned by the Admiralty. These were to be used by Admiralty staff. In July 1946 Portals wrote to the Admiralty agents in Plymouth requesting that “the large brick Air Raid shelter on the north side” of Stowford Lodge be demolished and carted away. This was signed by B K Allen, the Manager at that time. On 1st September 1939, Winston Churchill started the evacuation process, named Operation Pied Piper. With big cities sustaining heavy bombing campaigns, it was advised that children should be evacuated to quieter locations in the countryside. Devon proved to be a popular evacuation destination, with only major cities such as Plymouth and Exeter attracting German war planes. Thousands of children, as well as mothers with babies, were evacuated. It was documented that 150 evacuees came to Ivybridge, 100 to Ermington and a further 100 to Cornwood. 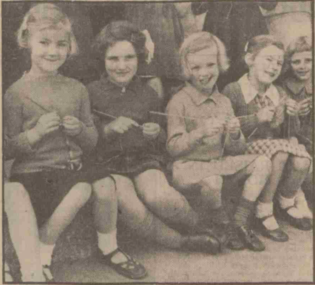 Evacuees knitting for the troops, while sitting on the steps of Ivybridge School in 1940. Once in Ivybridge they assembled in the council school where local people volunteered to provide a home. Under the government scheme, householders who provided temporary home were paid 10s. 6d. per week, where one child was taken, reducing to 8s. 6d. per child, when more than one child was housed. In June 1940, Sir John Reith, the Transport Minister, announced that highway authorities had been instructed to remove all signposts and direction indications which could be of value to the enemy during invasion. Posts were removed, shop boards and village hall notices were painted or covered over and any church or business naming the town or village in which it was situated, in most cases, also covered. As the threat of an enemy landing receded this order lapsed and by 1943 signposts gradually began to reappear. Reference: Ivybridge during the Second World War 1939-1945. Arthur L.Clamp. There was a Land Army uniform of green jumpers, brown breeches or dungarees, brown felt hats and khaki overcoats. As the Land Army was not a military force, however, uniform was not compulsory. The WLA badge depicted a wheat sheaf as a symbol of their agricultural work. There was also an official magazine The Land Girl. The movement was disbanded in 1950.